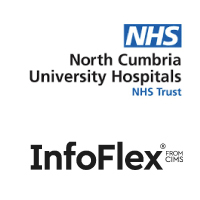 North Cumbria University Hospitals NHS Trust are using the Medical Interoperability Gateway (MIG) to view GP data and send electronic documents via their InfoFlex clinical portal system. North Cumbria University Hospitals NHS Trust has been using the MIG’s Detailed Care Record (DCR) service since 2016 to provide consultants, doctors, nurses and all other qualified medical staff with access to GP data at the point of care. Historically, this was accessed via the MIG’s Shared Record Viewer (SRV). The challenge was clinical staff had to log into separate systems to view data associated with the patient which was not as efficient as using the same system given the limited window of time to assess the patient. The desired solution was to provide clinical staff with access to patient records as an embedded view, so the user experience would be streamlined as possible, native from the InfoFlex clinical portal. The Trust worked with system providers to integrate patient information within the InfoFlex clinical portal. This enabled a simple and efficient process for accessing real time feeds of patient data such as their demographics, medication, risks and warnings, procedures, investigations, encounters, admissions and referrals. In September 2018 the Trust went live with Document Services, which has allowed them to send more than 14,000 InfoFlex eDischarge documents from two hospital sites since this date. The system is now live in over 15 wards including in patient units including medical and surgical, ambulatory care, the Heart Centre and Children’s Wards sending completed discharge summaries and medications to GP practices across Cumbria. The MIG feeds all the available information about a patient into a single system, which helps clinicians to make faster and more informed decisions at the point of care. “The InfoFlex clinical portal provides clinicians with single sign on and a context sensitive view of data pulled from various systems. It brings together data from various departments including radiology and imaging, document store and pathology results, which can now be accessed in one place alongside the MIG’s DCR. The versatility of the MIG and InfoFlex has suited the complex architecture of systems in Cumbria. With multiple organisations involved, the project was completed successfully, delivering benefits for health professionals; saving time and improving early diagnosis seamlessly.” Ian Harrison, Programme Manager, eHealth Cumbria. From July 2018 to January 2019 there has been a 75% increase in the number of requests to view a patient’s GP record through the InfoFlex clinical portal, helping to give the most complete view of a patient’s medical history. Document Services is now live across 85% of the Trust, which is helping to reduce paperwork and the time taken to deliver a document into the GP practice workload. “More than 14,000 eDischarge summaries have been sent and this is growing month on month. The Trust is well on its way to meeting national targets; ensuring eDischarge summaries are with the patient’s GP within 24 hours of discharge. The aim of the project is to complete the roll out by early 2019, improving patient safety and accessibility to patient records.” Andrew Woods, Senior Project Manager, eHealth Cumbria. The benefit for adopting digital is not just about the Trust though. GPs are getting consistent data sent at the point of discharge and also when patients are seen in clinics. This is a major change in process and welcomed by GPs and the staff in the surgeries. “Now as most of our clinical letters, outpatient letters and discharge summaries come electronically life is so much easier.” IT Administrator from Sedbergh Medical Practice. To arrange an online demonstration or to find out how the MIG is being used in your area, please call 0845 601 2642 or get in touch here. For more information about the InfoFlex clinical portal please call 01923 896939 or find out more here.